Lovely 2 double bedroomed bay fronted Period end terrace situated on a popular Cul-de-Sac, briefly comprising lounge through to dining room, fitted kitchen, 2 double bedrooms, larger than bathroom suite (was originally a 3rd bedroom) includes large walk in shower and 4 claw bath, cellars, retaining some original features, Delightful courtyard gardens, seconds Walk to Chorlton Park, walking distance to Metro and Chorlton Village, Ideal for first time buyer/Professional Couple. Lovely 2 double bedroomed bay fronted Period end terrace situated on a popular Cul-de-Sac, briefly comprising lounge through to dining room, fitted kitchen, 2 double bedrooms, larger than bathroom suite (was originally a 3rd bedroom) includes large walk in shower and 4 claw bath, cellars, retaining some original features, Front garden and delightful rear courtyard garden, seconds Walk to Chorlton Park, walking distance to Metro and Chorlton Village, Ideal for first time buyer/Professional Couple. RECEPTION HALLWAY: With external wooden door with inserts and glazed panel above. Cornice ceiling. Covered radiator. Stained wooden floors. FITTED KITCHEN: 11' 9" x 8' 4" (3.58m x 2.54m) Fitted with eye level wall units, base units and drawers. Built in wine rack and shelving. Built in stainless steel double oven, four ring gas hob and extractor hood. Stainless steel one and a quarter bowl sink drainer with mixer tap. Mosaic splash back tiling. Wall mounted Ravenheat combination boiler. UPVC double glazed window to side aspect. Tiled floor. Fitted shelving. Double glazed paneled door providing access and views to rear garden. FIRST FLOOR LANDING: With alarm sensor. Painted wooden floors. BEDROOM ONE: 14' 6" x 12' 2" (4.42m x 3.71m) With two UPVC double glazed windows to frontal aspect. Period cast iron fireplace. Painted wooden floors. Double radiator. Stripped door. BEDROOM TWO: 11' 11" x 9ft' 6" (3.63m x 2.9m) With UPVC double glazed window to rear aspect. Covered radiator. Stripped varnished floors. Period cast iron fireplace. Stripped door. BATHROOM: 11' 9" x 8' 3" (3.58m x 2.51m) Large four piece bathroom suite comprising large walk in double shower with chrome mixer with tiled splashback and glass screen, Four claw cast iron bath, porcelain wash hand basin and low level W.C. Obscure UPVC double glazed window to side aspect. Part obscure UPVC double glazed window to rear aspect. Double radiator. Painted wooden floors. Stripped door. CELLARS: Comprising one chamber and coal store area. Housing gas and electric meters. Power and light. OUTSIDE: There is a gravel stone front garden whilst to the rear is a delightful brick paved courtyard garden with mature borders. Brick and fenced boundary with timber gate leading to communal passageway. These particulars are believed to be accurate but they are not guaranteed and do not form a contract. Neither Emma Hatton Ltd nor the vendor or lessor accept any responsibility in respect of these particulars, which are not intended to be statements or representations of fact and any intending purchaser or lessee must satisfy himself by inspection or otherwise as to the correctness of each of the statements contained in these particulars. 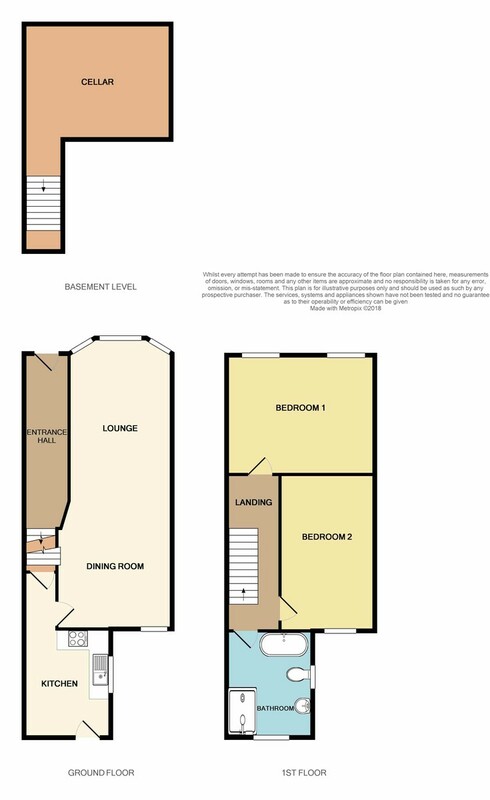 Any floorplans on this brochure are for illustrative purposes only and are not necessarily to scale.